1979 - President Carter appointed Paul Volcker as Chairman of the Federal Reserve Board. Volcker constricted the money supply to stop runaway inflation. The U.S. plunged into the deepest economic recession since the Great Depression, but soon recovered. 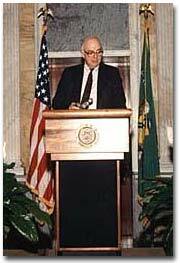 Paul Volcker. Courtesy of Paul Volcker.